This CellML model will run in PCEnv and OpenCell to recreate the published results. Note that the model will not run in COR because it contains differential algebraic equations (DAEs). The CellML transaltion of the model is based on the original Matlab code obtained from the model authors. However, the CellML model will only simulate 14 heart beats, because if statements (piecewise equations) were used instead of a remainder operator to cycle the heart beat, but this number of beats can be increased if desired. Abstract: Characterising circulatory dysfunction and choosing a suitable treatment is often difficult and time consuming, and can result in a deterioration in patient condition, or unsuitable therapy choices. A stable minimal model of the human cardiovascular system (CVS) is developed with the ultimate specific aim of assisting medical staff for rapid, on site modelling to assist in diagnosis and treatment. Models found in the literature simulate specific areas of the CVS with limited direct usefulness to medical staff. Others model the full CVS as a closed loop system, but they were found to be very complex, difficult to solve, or unstable. This paper develops a model that uses a minimal number of governing equations with the primary goal of accurately capturing trends in the CVS dynamics in a simple, easily solved, robust model. The model is shown to have long term stability and consistency with non-specific initial conditions as a result. An "open on pressure close on flow" valve law is created to capture the effects of inertia and the resulting dynamics of blood flow through the cardiac valves. An accurate, stable solution is performed using a method that varies the number of states in the model depending on the specific phase of the cardiac cycle, better matching the real physiological conditions. Examples of results include a 9% drop in cardiac output when increasing the thoracic pressure from -4 to 0 mmHg, and an increase in blood pressure from 120/80 to 165/130 mmHg when the systemic resistance is doubled. These results show that the model adequately provides appropriate magnitudes and trends that are in agreement with existing data for a variety of physiologically verified test cases simulating human CVS function. Derived from workspace Smith Chase 2004 at changeset f7b732c9707a. 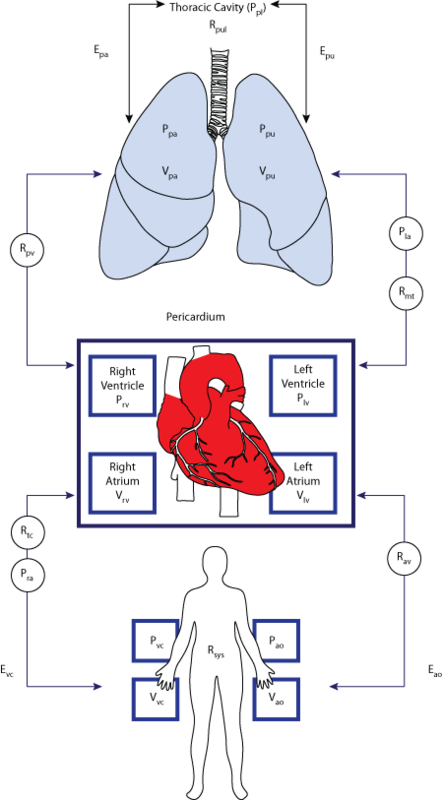 Minimal haemodynamic system model including ventricular interaction and valve dynamics.